When I was pregnant and found out we were having a little girl, I envisioned her jumping around in a little tutu taking ballet classes. Even after we received Ladybugs prognosis, I continued to have dreams where she was running around on a stage with her best friend from Mac Kids. Thanks to 2 incredible sisters Mallory and Jade, my dreams of Ladybug dancing on stage came true last week. Mallory and Jade are Occupational Therapists and Dance Instructors who started The Dance Ability Movement. 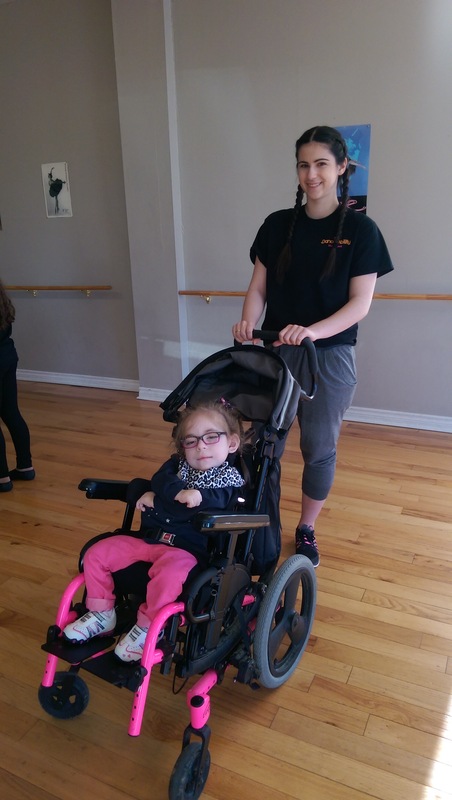 They offer safe and inclusive dance classes for children of all abilities. Each dancer also gets a volunteer dance buddy. Ladybug’s dance buddy’s were Selena and Claire. Here is a picture of Ladybug and her dance buddy Selena in one of the classes. I’ll post the professional dance pictures with both volunteers and the recital pictures once I get them back in a couple weeks. These dance classes also wouldn’t be possible without a host studio. We were very fortunate that Ballare Studio Dance agreed to be that host. The studio owner and dancers have been incredibly welcoming. I am counting down the days until we return to Ballare Studio Dance and see all our Dance Ability Movement buddies in September – approximately 90. Until then Ladybug will be keeping busy with playing baseball, day trips with her brothers, and splashing in the neighbours pool. What more could a girl ask for. So awesome!! I’ve been reading a lot lately about dance and this week started a dance class for my 2 who are blind. Of course, we don’t have amazing programs like this here in India… I wish! She looks so cute!! Would love to see a video!